Medical billing is a fundamental part of operating a healthcare business but it can turn into a time-consuming and frustrating activity for busy medical practices. From filing claims to trying to collect insurance company payments, this tedious but necessary task can very quickly become a big headache. 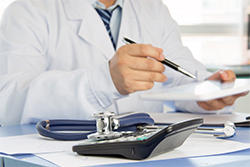 At Mitul Mehta CPA PC, our medical billing and collections services can relieve your staff of the burden of staying on top of these tasks and ultimately facilitate better cash flow in your business. Our Dallas, TX CPA firm specializes in working with medical practices nationwide and can manage all or just a portion of your billing system, depending upon the specific needs and demands of your business. We possess the skills to file claims accurately and collect payments promptly so its easier to manage your finances. Call us at (214) 746-5074 today to schedule an appointment for a strategy session.